To setup your RadPivotGrid easily at design time you can invoke the RadPivotGrid Property Builder from the SmartTag menu of RadPivotGrid. General tab: On this tab you can set the DataSource and DataMember properties, as well as the ErrorString and EmptyValueString properties. 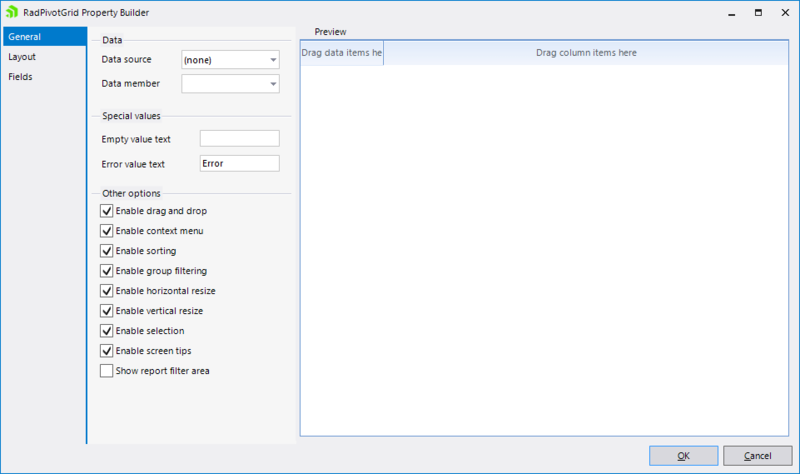 Additionally there are a bunch of boolean properties related to enabling or disabling the build-in features of RadPivotGrid: drag & drop, context menus, sorting, filtering, resizing, etc. Layout tab: On this tab you can edit the properties related to modifying the appearance of RadPivotGrid, like the layout type of the headers, the positions of the SubTotals/GrandTotals and the width or height of the different areas. Fields: On this tab there is a RadPivotFieldList control which allows you to organize the fields from your data source in the desired descriptor collection.